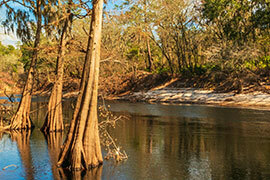 A total of $300,000 in grants currently is available to farmers in the Suwannee River Basin River. The Sustainable Farming Fund, administered by Stetson University’s Institute for Water and Environmental Resilience (IWER), is seeking proposals to award up to $300,000 in grants to private farmers in the Suwannee River Basin for sustainable farming practices. The Sustainable Farming Fund was established through court order by the federal district court in Jacksonville. IWER has three years to award up to $1.3 million from the fund. As an independent third party, IWER was selected to help farmers reduce pollution draining into the Suwannee River and area springs. The fund, to be administered by the water institute, will provide grants to farmers based on proposals. Over the summer, Henderson met with government agencies, agricultural and environmental groups, and local farmers to better understand what is needed and what farmers are willing to try. Improved technology and innovative farming practices will be required to meet the need for reducing nutrients in the aquifer. “Science shows us that increased nutrients in the aquifer is the major cause of decline in water quality in our springs,” Henderson said. Nearly every Florida spring shows visible signs of stress and pollution such as lack of clarity in the water. The request for grant proposals was timed to coincide with the release of the Suwannee River Basin Management Action Plan. The plan was approved by the Florida Department of Environmental Protection in June and sets forth a goal of reduction of more than four million pounds of nitrogen per year over the next 20 years in order to meet water quality standards for the springs that flow into the Suwannee River. The plan requires farmers to use Best Management Practices but acknowledges the goals cannot be achieved unless farmers use precision agricultural techniques to reduce fertilizer use beyond that required by BMPs. The Sustainable Farming Fund will incentivize farmers to take advantage of new technology and innovative techniques. The request for proposals also will be coordinated with the award of Springs Restoration Grants from Florida Department of Environmental Protection to Suwannee River Water Management District. The Legislature has set aside $50 million a year for springs restoration and this year two important grants were awarded to SRWMD that can broaden the reach of the Sustainable Farming Fund. A total of $3 million was awarded for Precision Agriculture techniques that result in lowering nutrients and grants from the Sustainable Farming Fund can be used to match against this program. The SRWMD also was awarded $1.8 million to engage stakeholders including Stetson University to negotiate cost-effective land conservation and management incentives. Springs Restoration is a focus area for the Institute for Water and Environmental Resilience. The Sustainable Farming Fund was established through a consent decree in a water quality lawsuit brought by Sierra Club and Environmental America against Pilgrim’s Pride, Corp., the nation’s second largest chicken producer. More information and instructions on how to submit a proposal can be found at www.stetson.edu/sff. Proposals will be accepted through Sept. 4.